Why does it still feel too early to start thinking about Christmas in earnest? Happens every year, when I get to the week before, completely unprepared as usual, I shall wish I'd done my shopping in August and put the sprouts on in June and of course I'm still beating myself to a pulp about not making a Christmas Cake in October. But this book has come my way and it's too good to leave unannounced. 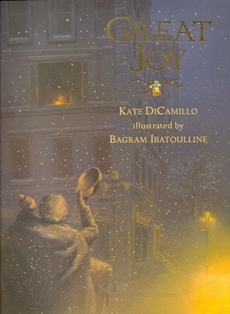 Great Joy by Kate DiCamillo and illustrated by Bagram Ibatoulline and published by Walker Books. We have our own favourite children's Christmas books, get them out every year and have a good nostalge (I've invented that verb, before the grammar police screech in and slap on a fine, it's lacking in the English language and I need it, use it and like it) about those wonderful years of Christmas with saucer-eyed children brought to the verge of sickness with excitement at the preparations. So much so that the tree still traditionally doesn't go up until very near the day because I can't be sure they are any better in their twenties once they all arrive home. I haven't added any books to the selection for years until this one arrived and I have been transfixed by the illustrations. I think I can cope with oodles of sentimentality and nostalgia at Christmas so have overriden any hint of that in this book with ease. 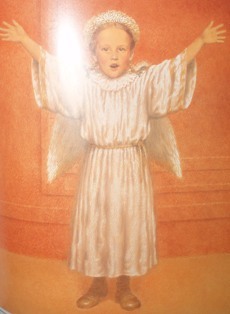 Set in New York, I think 1930's or thereabouts and Frances spots an organ grinder and his monkey from the window of the family apartment.The story unfolds around Frances's part in the school nativity play coupled with her childlike concern for the organ grinder sleeping out on the street and it is beautiful. 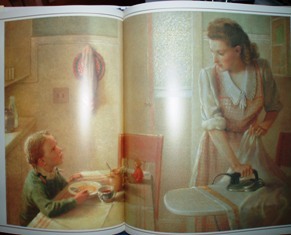 The illustrations are of such a high standard I could look at them for hours. 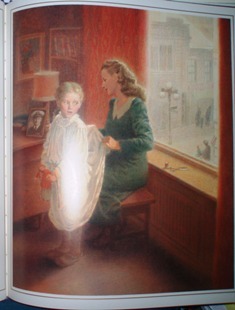 The colours are dusky and purplish hazed, muted sepia-like tones which capture the essence and the atmosphere to perfection and I suspect will do likewise with a child's imagination.Gentle on the eye, the glowing shop windows shine out on Fifth Avenue against this backdrop and the intensity of Frances's emotion all showcased to best effect.Frances is a little treasure, a perfect angel in boots.